You may take supplements to improve your overall health, treat a health condition, lose weight or boost your immune system. When you start a new supplement, it's important to understand the proper dosage for the supplement and evaluate the way it interacts with other supplements and medicines. Also look to your diet to see if you already gain high levels of vitamins from food. Taking the wrong combination of supplements or too much of a supplement can lead to adverse health effects. Discuss any supplement use with your doctor. Numerous vitamins cause toxicity when you take in too much of them, either via a supplement dose that is too high or the combination of ingesting the vitamin from food plus a supplement. If you take enough preformed vitamin A to suffer acute toxicity, you may experience fatigue, headache, dizziness, nausea, dry skin and appetite loss. Signs of chronic vitamin A toxicity include itchy skin, appetite loss, bone and joint pain and skin peeling. Too much vitamin D can cause constipation, confusion, weakness, poor appetite, nausea, vomiting, heart rhythm abnormalities and kidney stones. 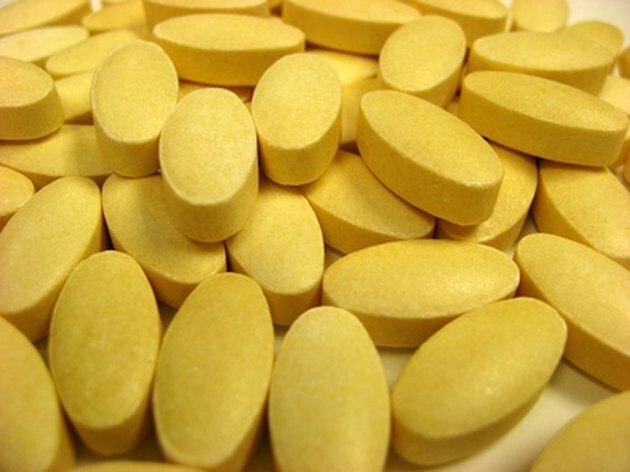 The usual solution for vitamin toxicity is to stop taking supplements. In severe cases, hospitalization is needed. Always check to see if there is a tolerable upper limit, or UL, for vitamins and discuss supplementing with your doctor. Niacin, vitamin B-6, vitamin C, vitamin E, folic acid, calcium, copper, iron, magnesium, manganese, phosphorus, selenium and zinc all have upper limits. Taking too much of a supplement, or taking it for too long, may lead to serious adverse effects. For example, black cohosh is often used to alleviate symptoms of premenstrual syndrome and to combat symptoms like night sweats associated with menopause. Numerous cases of liver inflammation are associated with this herb, warns the National Center for Complimentary and Alternative Medicine. This possible side effect led the experts at the U.S. Pharmacopeia to recommend discontinuing black cohosh if you have a liver disorder or if you experience symptoms of liver problems including jaundice, dark urine or abdominal pain. Kava also may cause liver damage. In fact, the U.S. Food and Drug Administration issues a warning about this herb. Taking numerous supplements together can magnify their effects. For example, aloe, cascara sagrada, senna and yellow dock all have laxative properties. Green tea, guarana, ma-huang, bitter orange, cola nut, ginseng and caffeine all have stimulant properties. Kava kava, St. John's wort, chamomile, valerian and lemon balm all have sedative properties. Supplements that lower blood glucose and raise risk for hypoglycemia include bitter melon, ginseng,devil's claw, bilberry, fenugreek, garlic, white willow and horse chestnut. Supplements with diuretic properties include uva ursi, dandelion, burdock and yarrow. If you have a health condition, be careful about taking supplements. For example, if you have estrogen-sensitive breast cancer or another hormone-sensitive condition chaste tree berry may worsen your condition because it can have hormonal effects. Same goes for black cohosh, licorice, red clover and alfalfa supplements. If you have pelvic inflammatory disease catnip may worsen your condition. Taking bladderwrack may worsen cases of hyperthyroidism or iron deficiency. Astragalus can worsen autoimmune diseases because it increases immune system activity. Supplements can increase risk for certain toxicities. For example your risk for monoamine oxidase inhibitor, or MAOI, toxicity, increases when you take certain supplements with drugs like iproniazid or selegiline. These include kava kava, licorice, ma-huang, St. John's wort, yohimbe, ginseng and chaste tree berry. Some supplements, such as kava kava, taken in combination with certain migraine or antidepressant medicines raise risk for the potentially life-threatening condition called serotonin syndrome that causes your serotonin levels to rise too high.